3D Builders, LLC is a energy star builder parner general State Licensed Residential Contractor and a State Licensed Roofing Contractor for Deland, FL Debary, Orange City, Deland, Deltona, Lake Helen, Daytona Beach, Port Orange, Holly Hill, Ormond Beach, Ponce Inlet, Daytona Beach Shores, Osteen, New Smyrna Beach, Edgewater, South Daytona, Sanford, Lake Mary, west volusia county and volusia county. As a general Residential Contractor we provide builder services, custom homes, affordable homes, modular, panelized, additions, remodels, kitchen remodeling, bathroom remodeling, remodel, owner builder consulting, investor and bank rehabs, and as a Roofing contractor we provide Shingles, Metal, Roofing, Roofers, Reroofs, for residential home owners. Our area includes Residential general construction contractor in deland, fl debary deltona orange city deleon springs west volusia roofing energy star solar remodel home builder. Home inspector and home inspection services. © Copyright 2005-2010 3D Builders, LLC. We are proud to offer new homes that have earned the ENERGY STAR® label. To earn the ENERGY STAR, a home must meet strict guidelines for energy efficiency set by the U.S. Environmental Protection Agency. These homes are at least 15% more energy efficient than homes built to the 2004 International Residential Code (IRC), and include additional energy-saving features that typically make them 20–30% more efficient than standard homes. To increase the energy efficiency of our homes, we build homes with effective insulation, high-performance windows, sealed ducts, efficient heating and cooling systems, and energy-efficient appliances. Specifically, that means we would upgraded the insulation to R-13 for walls and R-30 for ceilings, high-performance low-E windows, high-efficiency 14 SEER heat pumps, and Energy Star-rated appliances, among other moves. As part of the energy star certification process we also conduct duct blaster and blower tests on all homes to ensure there are minimal leaks. To ensure that a home meets ENERGY STAR guidelines, third–party verification by a certified Home Energy Rater (or equivalent) is required. This Rater works closely with the builder throughout the construction process to help determine the needed energy–saving equipment and construction techniques and conduct required on–site diagnostic testing and inspections to document that the home is eligible to earn the ENERGY STAR label. ADDED CONFIDENCE - Home buying is complex enough without having to know all the details of energy-efficient construction. Instead, look for the government-backed ENERGY STAR label to easily identify homes that are truly energy efficient. Find the house of your dreams and enjoy peace of mind knowing that it also meets strict energy efficiency guidelines. LOWER OWNERSHIP COST - Compared with standard homes, ENERGY STAR qualified homes use substantially less energy for heating, cooling, and water heating-delivering hundreds in savings. Over the average 7 to 8 years you may live in your home, this adds up to thousands of dollars saved on utility bills. Additional savings on maintenance can also be substantial. BETTER PERFORMANCE - Properly installed energy-efficient improvements deliver better protection against cold, heat, drafts, moisture, pollution, and noise. An energy-efficient home helps ensure consistent temperatures between and across rooms, improved indoor air quality, and greater durability. ENVIRONMENTAL PROTECTION - Did you know that your home can be a greater source of pollution than your car? In fact, 16 percent of U.S. greenhouse gas emissions are generated from the energy used in houses nationwide. Energy used in our homes often comes from the burning of fossil fuels at power plants, which contributes to smog, acid rain, and global warming. Simply put, the less energy we use in our homes, the less air pollution we generate. 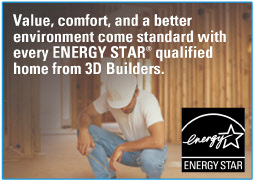 Ask us about building you an energy star rated home! Home being tested by a Rater.